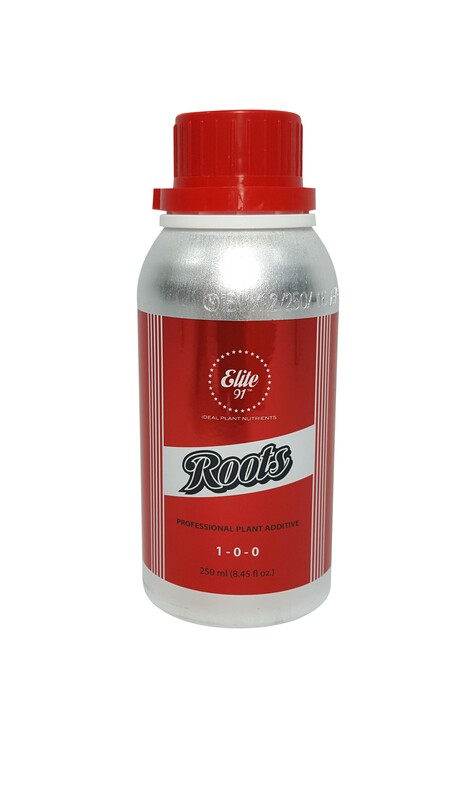 Elite 91 Roots - Root & Plant Growth Enhancer is a highly effective root-enhancing solution. The Elite 91 Roots formula is a proprietary liquid formulation containing high-quality ingredients that boast high concentrations of multiple different beneficial bacteria, fungi, vitamins, plant derived minerals, protein hydrolysates, polysaccharides, organic chelates, and activators. Warning: Do not use hydrogen peroxide or any chemical sterilizing agents when using Elite 91 Roots. Elite 91 Roots - Root & Plant Growth Enhancer is a highly effective root-enhancing solution. 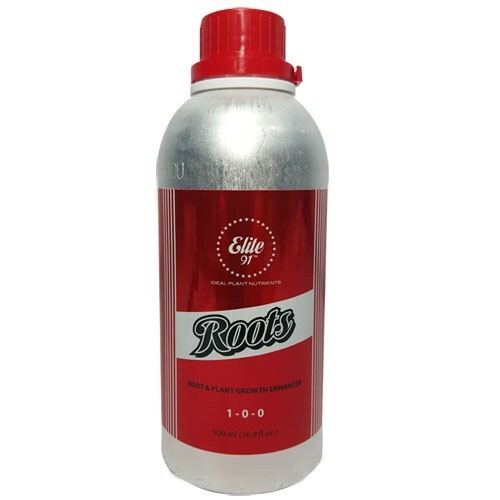 The Elite 91 Roots formula is a proprietary liquid formulation containing high-quality ingredients that boast high concentrations of multiple different beneficial bacteria, fungi, vitamins, plant derived minerals, protein hydrolysates, polysaccharides, organic chelates, and activators. Elite 91 Roots - Plant Growth Enhancer boosts your plant's natural health and growth hormones in a single bottle. Plant Growth Promoting Rhizobacteria (PGPR) are a group of free-living bacteria that colonize the roots of plants and construct a protective biofilm around the roots (also known as the rhizosphere). The PGPR found in Roots benefits root growth and vigor. The species of rhizobacteria in Elite 91's formulation have been selected for their effective and successful modes of action. Effects include, but are not limited to: Increases in the size, density and surface area of the plant's root system, resulting in healthy crop growth as well as improved water and nutrient uptake for optimal yields. PGPR supply biologically fixed nitrogen and increase phosphorous uptake by solubilizing inorganic phosphate. PGPR also break down organic compounds and micronutrients for efficient utilization and uptake by the plant roots. Induces natural production of plant growth hormones such as auxins, cytokinins, gibberellins, ethylene, and abscisic acid for maximizing genetic plant growth potential. PGPR increases yields in various high-value crops, enhances rooting of cuttings, and improves seed germination and emergence of cuttings under various conditions. Increases tolerance to harsh environmetal conditions such as salinity or drought. PGPR exerts an indirect effect on plant growth by synthesizing broad-spectrum antibiotics that protect the plant from harmful pests and diseases. PGPR stimulates a plant's immune system, protecting it from diseases and pests. Directions for Use Add Elite 91 Roots with every feeding from seedling/cloning growth state up until the 5th or 6th week of the crop's fruiting/flowering cycle. For Soil, Coco, and Hydropnics systems: Add 0.5ml to 2ml per gallon of nutrient solution. For Compost Tea: Add 1ml to 5ml per gallon of nutrient solution. For Seedlings/Cuttings: Pre-soak your preferred choice of growing medium in a solution using 1ml to 5ml per gallon of water. Continue to use the same dosage rate to feed your new starts throughout the rooting phase. A little goes a long way! A 250ml bottle can treat 1,892 Liters (500 gallons) of nutrient solution at a ratio of 0.5ml per gallon. A 500ml bottle can treat 3,785 Liters (1000 gallons) of nutrient solution at a ratio of 0.5ml per gallon. A 1L bottle can trat 7,570 Liters (2000 gallons) of nutrient solution at a ratio of 0.5ml per gallon.